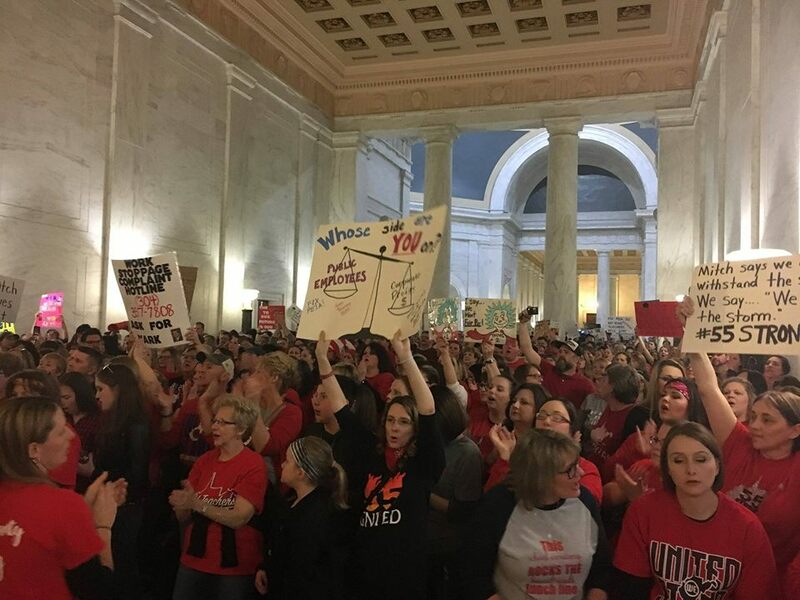 “Until they sign it, shut it down!” chanted West Virginia teachers from all 55 counties across the state at a demonstration in the capitol building on the eighth day of an illegal strike. The teachers, three quarters of them women, defied insults hurled at them by politicians, being called “dumb bunnies” and “rednecks,” showing up to the capitol building wearing bunny ears and red bandannas. Winning a 5% raise for all public employees in a “red” state that only recently passed right-to-work, the teachers exposed the mass anger in society against the neoliberal agenda of cuts to education, health care, and social services alongside handouts to the super rich and corporations. While the mainstream media largely ignored the strike at the start, workers around the country followed the events in West Virginia on social media. The victory is likely to inspire an increased determination by working people to fight for a decent standard of living. In Oklahoma, one of the few states that pays teachers less than West Virginia, teachers are now planning a statewide walkout that may take place in April. There is also talk of strike action by teachers in Kentucky, Arizona and New Jersey. As the Supreme Court considers the Janus case – an attempt to impose the type of right to work conditions that exist in West Virginia on the whole public sector nationally – the teachers’ stand is all the more inspiring. This fight shows that working people and unions do not need to take these attacks as done deals – they can be beaten back! Third lowest paid in the nation and facing not only a teacher shortage but increasingly difficult challenges with many students coming from impoverished homes in the midst of a raging opioid epidemic, West Virginia teachers have had enough. Echoing the ghosts of past militant labor struggles, the strike was born out of a rank and file revolt and deep reservoirs of class consciousness. Reacting to pitiful wage increases that did nothing to cover out of control health costs, teachers demanded a five percent pay hike for all public employees and for the legislature to address the ballooning costs of the Public Employees Insurance Agency (PEIA). Represented by two unions, the West Virginia Educators Association (WVEA) and the American Federation of Teachers (AFT), it was an emerging layer of rank and file leaders who had organized the strike in the weeks and months leading up to it, while the top leadership of the unions had failed to mobilize teachers. West Virginia Governor Jim Justice, a billionaire coal baron, has, like previous governors, given huge tax breaks to extractive industries such as coal and natural gas. His administration has asked the working class of West Virginia to make sacrifices and accept austerity while he owes millions in back taxes in West Virginia as well as Kentucky. Bernie Sanders won all 55 West Virginia counties in the 2016 primary. No wonder, since Hillary Clinton was quoted as saying “I’ll put coal miners out of business.” Clinton’s neoliberal policies in the general election were overwhelmingly rejected by voters. But without a credible pro working class candidate on the ballot, this opened the door to the right populism of Donald Trump. While anti-immigrant sentiment certainly played a significant role, West Virginians primarily voted for promises of jobs and protectionist trade policies. While much of the American liberal left concluded that the working class in states like West Virginia, which voted 68% for Trump, should be dismissed as one reactionary mass, Socialist Alternative explained the contradictory reality and the need for the labor movement to take a stand and build a movement that spoke to the common interests of all working people while also boldly fighting racism, nativism and sexism. The West Virginia teachers, less likely to vote Trump than the state as a whole and also inspired by the emerging women’s movement, point precisely to the class contradictions in Trump country. Led in part by leftists, the rank and file revolt won the support of the mass of the West Virginia working class in a stand-up fight with a reactionary, Republican dominated legislature . In the months leading up to the strike, the WVEA and AFT leaders attempted in vain to prevent a strike through backroom negotiations with the state legislature. At the same time, within the rank and file, teachers were preparing themselves for a wider struggle. Despite mainstream media framing the wildcat strike as spontaneous, the strike began because of the work of dedicated rank and file teachers who had been organizing in their schools to politically and logistically prepare for a strike. The union leaders, not anticipating or wanting a strike, failed , in the words of one teacher to “do the job we are paying them to do, organize a strike.” When the strike began, they had little ability to contain it as action had been organized from the bottom up. As a result of this organizing and the experience of the strike, a new radical leadership is developing within the teachers’ unions in West Virginia, some of them identifying as socialists. When union leaders and the Democrats announced on Tuesday, February 27, three days into the strike, that a deal had been made with the governor to give teachers a 5% raise and all other public employees a 3% raise, they asked teachers to trust them to finalize the deal and go back to work. The teachers were seething with anger. Faith in the politicians’ “guarantees” had evaporated and they saw that the status of PEIA was not addressed. As the union leaders failed to respond to workers’ questions about the deal, rank and file leaders encouraged teachers to stay on strike. One teacher expressed that up until that point he had been confident in the union leadership to lead the strike but ordinary teachers lost faith as it became clear that the leadership were not able to deliver on their promises.The teachers voted the next day with their feet to continue the strike. Community support was organized for the striking teachers and, as the state legislature attempted to punish the strikers by lowering the raise to 4%, teachers threatened to occupy the capitol building. The strike being already underway, teachers prepared over the weekend for the long haul, vowing to remain until their demands were met and to accept no compromises or promises. By Monday night, it appeared that the strike would continue indefinitely. Seeing the rank and file revolting and the process of radicalization underway, on the morning of March 6, union leaders and the Democratic Party politicians attempted to demobilize and end the strike yet again. Alongside the governor, they appeared before the striking teachers massed outside the state senate doors to announce that the strike had been won and that the teachers should go home. Shouting from the crowd, many teachers asked to see this victory in writing. Teachers and other workers chanted “Words mean nothing, sign the bill!” It quickly became clear that no one would leave until the bill was signed. The Democratic Party responded that, according to the state senate rules, they had to wait 24 hours for the finance committee to review the bill before they could sign it. To this the teachers responded with chants of “Until they sign it, shut it down!” Some teachers began to sit as many prepared to occupy the capitol building. As a militant occupation looked inevitable, teachers waited, and after a few hours, all the supposed red tape that Democrats had used as an excuse for why the bill could not be finalized disappeared and both houses had signed the bill. And while the 5% increase is a clear victory, the question of health care costs remains to be properly addressed. This could spark another phase of the struggle in coming months. Before and during the strike, the Democrats played the role of middlemen between the teacher unions and the Republican-controlled legislature. They attempted to channel anger into the November election and attempted to divert anger towards a handful of specific legislators, such as Mitch Carmichael, leader of the Senate Republicans and the face of opposition to the teachers. Carmichael was vilified throughout by the Democrats in an attempt to absolve Governor Justice and other legislators, who – until forced to move by the strike – had been just as opposed to the teachers’ just demands. While the call to get out and vote in November was taken up by the teachers, such as in the popular and frequent chant “In November, we’ll remember,” it will be important for the teachers and their allies of West Virginia to seriously discuss how their interests can be represented in the political arena. The terrible choice between corporate liberal Hillary Clinton and the racist populist in Donald Trump shows the danger of expecting establishment politicians to be a viable path forward. Beyond electoral politics, the strike shows that even with reactionary politicians in office, gains can be won through mass mobilizations and class struggle. Many teachers have expressed that, after a week of empty promises, they trusted neither the Democrats nor the Republicans nor the union leadership to give them victory. Action was needed immediately and teachers would not calmly wait until the next election. The West Virginia strike showed the country what solidarity looks like. The $320,000 plus raised online for the strike fund and the hundreds of pizzas rolled in on carts daily, paid for by the San Francisco teachers union are the most visible examples. Union members from across the country arrived to stand shoulder to shoulder with the teachers. The strongest show of solidarity came from the working class across the state of West Virginia itself. Socialist Alternative members from Pittsburgh, Columbus, Philadelphia, and Seattle traveled to Charlestown to stand in solidarity with the striking teachers. We engaged in many conversations, listening to what workers had to say and expressing our support for their struggle. Teachers were more than happy to talk to us even though there was some suspicion of “socialism”. But once we established that we were there to listen and support their struggle, they were actually excited to speak with open socialists. DSA members and other self-described socialists on the ground in West Virginia and embedded in the unions deserve credit for helping to lead and radicalize the strike in opposition to union leadership. Some far left groups however, who arrived after the strike began, approached the workers as outsiders and felt the need to lecture them. This only helps those who would try to discredit the left in the eyes of workers. The key question coming out of this strike for the labor movement nationally is whether this is the beginning of a real turnaround after decades of retreat. It has to be acknowledged that there were specific factors that helped the teachers in West Virginia including powerful traditions of solidarity and the serious shortage of qualified teachers. Given poor pay and the very difficult nature of the work, the authorities could not realistically threaten to fire and replace the teachers with people from outside the state. The current threat of strike action by teachers in other states points to how this can spread but, at this stage, the upsurge is centered on teachers and there are very specific reasons for that. Twenty years of savage attacks on public education have left teachers across the country deeply discontented. And despite the unrelenting anti-teacher propaganda from the mainstream media, there is mass support for teachers when they stand up. This was seen when the Chicago Teachers Union went on strike in 2012. The role of women in these movements can’t be understated. The West Virginia strike was led in part by radical women in the rank and file. Predominantly female workforces such as teachers and nurses have been on the forefront of militant labor struggles over the last period. In the midst of a budding mass women’s movement around issues like equal pay and sexual harassment in the workplace, women in labor unions have a pivotal role to play in building a wider fightback by working people. But there are real obstacles facing insurgent forces in the public sector unions including the leadership of the national teacher unions which have favored trying to use its “political influence,” rather than collective power to push back. In practice, this almost always means supporting and lobbying Democrats. But under Obama, the Democrats were in the lead in attacking teachers through high stakes testing, attacking seniority rights, and privatization schemes, including trying to replace public schools with charter schools. The unions’ “political strategy” is completely bankrupt. Bernie Sanders’ 2016 campaign started to point the way toward a real political strategy for labor by refusing corporate money and raising tens of millions of dollars for a pro-working-class program including a $15 minimum wage, Medicare for All, and tuition-free college. Bernie should have gone further and run all the way to November 2016. As well as reclaiming the traditions of collective struggle including the strike weapon, we need to lay the ground for a new party that represents the interests of working people and all the oppressed. Now we live in the era of Trump and the stakes are even higher. Trump’s solicitor general was in front of the Supreme Court right before the West Virginia strike presenting arguments supporting Janus and attacking the role public sector unions for allegedly “compelling” people they represent to give money for work, like raising wages, they don’t agree with. As we have consistently said in relation to Janus and the previous Friedrichs case which ended in a draw because of the death of Justice Scalia, labor needs a strategy that is not based on accepting that we inevitably will lose. The boldness of the West Virginia teachers shows that there is no time to waste. Workplace meetings and rallies should be held at every unionized public sector workplace in the country against Janus. This should be the launching point for a massive national day of action where millions of unionized workers come on the streets to say that they won’t be pushed back to the pre-union era and to declare that they are fighting not just for themselves but for the entire working class. This will put the labor movement on a direct collision course with Trump, the Republicans and the whole corporate elite but that’s exactly what needs to happen. There are some hopeful signs for the labor movement nationally including a slight uptick of membership last year concentrated among younger workers. But there is also a desperate need to relearn the militant traditions of the past and to forge a new leadership that can assimilate the lessons of battles like West Virginia and point the way forward. West Virginia shows that even under reactionary administrations, offensive struggles can be waged and gains won. As in previous periods, socialists will have a key role to play in that effort.